Newspaper advertising revenues are on track this year to dive to a 25-year low of approximately $26.5 billion, or 47% of the record $49.4 billon in sales achieved by the industry as recently as 2005. Even through the rate of sales decay at newspapers slowed to -5.6% in the second quarter of this year from -9.7% in the first three months, the total $12.4 billion in sales booked in the first half of 2010 were 7.6% lower than the depressed sales in the first six months of the calamitous year of 2009. 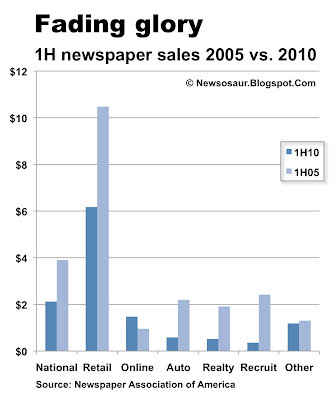 In 2009, the combined print and online ad sales at newspapers fell 27.2% to $27.6 billion. The Newspaper Association of America, an industry-funded trade group, provided all sales statistics cited here. The second-quarter sales figures were posted on its website today. Following a historic pattern than shows newspapers take in roughly 47% of their ad revenue in the first half of the year, it is possible to project that full-year sales for the industry will drop some $2 billion this year to finish at approximately $26.5 billion. Assuming no major positive or negative changes in the economy between now and the end of the year, this will put newspaper ad sales back to the lowest level they have seen since 1985.
:: Employment want-ads swooned 85.2% to $358 million in the first half of this year from $2.4 billion in 2005.
:: Automotive classified dropped 73.3% to $587 million from $2.2 billion. :: Real estate classified slid 72.8% to $519 million from $1.9 billion. :: National advertising declined 45.7% to $2.1 billion from $3.9 billion. :: Retail advertising fell 41.1% to $6.2 billion from $10.5 billion. :: “Other” classified advertising slipped 9.1% to $1.2 billion from $1.3 billion. Many publishers report that the comparative health of this category has been sustained by the legal notices that are required in many jurisdictions by the real estate foreclosure process. The only bright spot for publishers in the last five years is that online advertising has climbed 54.3% to $1.5 billion in the first half of 2010 from $955 million in 2005. Unfortunately, this category represented only 11.8% of total newspaper revenues in the first half of 2010 and its growth has done nothing to offset the prodigious declines in all the other advertising verticals. Further, as reported previously here, ad sales at newspapers and magazines continued to fall in the first part of this year while television, Internet and radio sales rebounded handsomely from the setbacks they suffered in the deepest throes of the recession. Alan, it must be like a death watch for you, seeing the continuing decline and demise of newspapers. The sad part is it irreversible, the opportunity to convert subscribers to digital copies is long gone..and so are the ad dollars. Arrogance and Ignorance must be why this has happened to such a once vibrant industry. What is happening with the other medias? 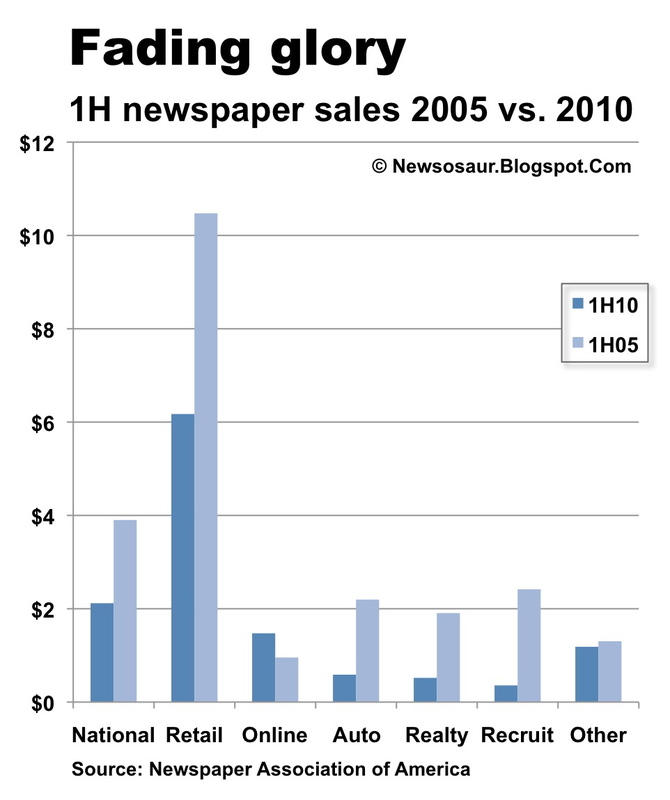 What percent of total advertising do newspapers hold now? In 2005? Without knowing the answers to this important questions, how do we know what these very negative statistics mean? So that's $26 billion wasted by advertisers. In five years, online goes from just under $1 billion to $1.5 billion. What a pittance for so much attention in so many publisher's suites. I'm with MrMediaPro - we blew it at the outset by giving it away for free. You can never charge for what's free. How about an iHype ‘tax’ to save the news?